Perhaps more than any other problem humanity has faced, climate change confronts us with the reality of our interdependence. No country alone can protect their citizens from the impacts of dangerous climate change. The impacts of climate change already effect the enjoyment of peoples’ human rights and these can further undermined if climate action is not informed by human rights norms. Left unchecked, climate change has also the potential to wipe out the development gains of recent decades. It is therefore imperative for any climate action to protect and respect human rights. This can be achieved with a climate justice approach, which is the basis of the Foundation’s work on human rights and climate change, in line with the Principles of Climate Justice ‘Protect and Respect Human Rights’ and ‘Support the Right to Development‘. Over the past decade, the Human Rights Council (HRC) and the United Nations Framework Convention on Climate Change (UNFCCC) have explicitly addressed the links between human rights and climate change. The Paris Agreement is the first climate change treaty to contain any mention of human rights. In its preamble it states that Parties should “when taking action to address climate change, respect, promote and consider their respective obligations on human rights”. The Foundation has been working with the human rights and climate change communities to improve linkages and encourage the exchange of experience and good practice examples, for example by supporting the Geneva Pledge on Human Rights in Climate Action. The global community is tasked with ending poverty and enabling sustainable development while tackling the climate crisis. In order to advance climate justice and achieve the ultimate goal of the Paris Agreement, a rapid peaking of the world’s carbon emissions by 2020 and a complete phase out of carbon emissions by 2050 is required. Left unchecked, climate change will roll back decades of development progress and our ability to achieve ambitious, consensual targets set out in the 2030 Agenda for Sustainable Development. Actions taken to adapt to the impacts of climate change and to reduce the emissions that cause global warming, ultimately protect people’s rights as they aim to avoid dangerous climate change. However, climate actions designed and implemented without respect for human rights risk undermining people’s rights. The Mary Robinson Foundation – Climate Justice commissioned an extensive survey to assess the extent to which countries are reporting on the links between human rights and climate change in two international processes under the United Nations between January 2010 and December 2015. The findings of the research are summarised in the Foundation’s publication Incorporating Human Rights into Climate Action. 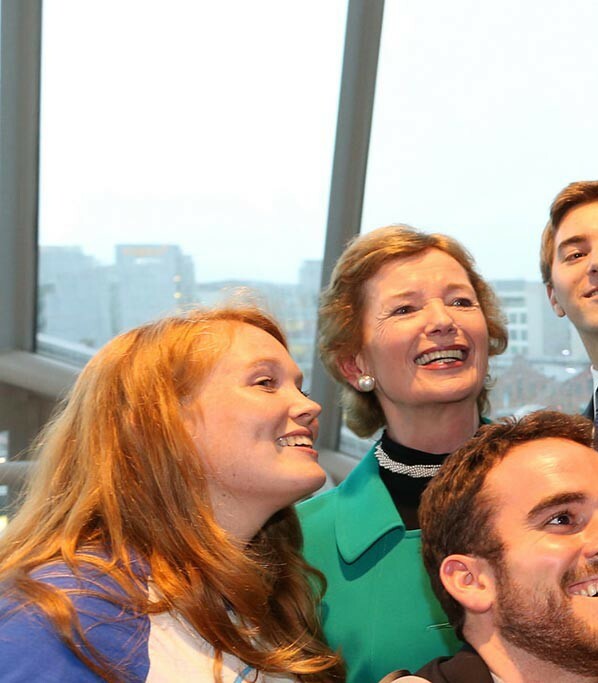 Subsequently, the Mary Robinson Foundation – Climate Justice and the Centre for International Environmental Law collaborated to produce an online resource allowing users to explore the data compiled as part of this research. This tool is intended to provide helpful references for anyone seeking to better understand how states have reported on the linkages between human rights and climate action under the UNFCCC and the HRC. This resource can be a accessed here. A global phase-out of carbon emissions can only work if it is done fairly and enables all people to realise their right to development. As we leave the era of fossil fuel based development behind, developing countries must receive unprecedented supported from the international community as they pioneer new, sustainable development pathways. Today, more than 1 billion people still have little or no access to electricity and over 3 billion people do not have access to clean cooking facilities. Often, those living in energy poverty also experience marginalisation and acute economic poverty. However, when people have access to energy services, outcomes in fields such as health, education, economic growth and poverty reduction improve. Therefore, ensuring universal access to sustainable energy services is not just critical to achieving Sustainable Development Goal 7 (Ensure access to affordable, reliable, sustainable and modern energy for all), it is also central to the realisation of many of the other SDGs. To ensure that all people are enabled to take part in the transition to a zero carbon and zero poverty future, innovative, targeted approaches will be necessary to reach the very poorest people and communities. The Foundation’s ongoing work on equitable access to sustainable energy provides a good example to illustrate how climate action can progress sustainable development and reach the furthest behind first. The Foundation’s focus on the rights of the most vulnerable has also led it to undertake work across platforms on Climate Displacement. The Foundation supports the view that displacement that is caused substantially by the impacts of climate change can and should be classified as ‘climate displacement’. Climate displacement is a growing issue faced by millions of people and its impacts can be felt at the international, regional, national and sub-national level. The most recent report of the Intergovernmental Panel on Climate Change noted that ‘vulnerability is inversely correlated with mobility, leading to those being most exposed and vulnerable to the impacts of climate change having the least capability to migrate’. Despite this inequality, climate displacement has, to date, been dealt with in an ad hoc manner in international and domestic fora. In 2017 we have seen this trend slowly reversing. The Human Rights Council included climate displacement as a central theme in its annual Human rights and climate change resolution, including through emphasising the ‘urgent importance of continuing to address… consequences of climate change … including migrants and persons displaced across international borders in the context of the adverse impacts of climate change’. Similarly the New York Declaration in 2016 launched the process of negotiating a global compact on safe orderly and regular migration by 2018. Finally the UNFCCC has been undertaking work on climate displacement through its ‘Taskforce on Displacement’, as well as the Executive Committee of the Warsaw International Mechanism for Loss and Damage. The Foundation has been engaged, and will continue to engage in each of these processes, along with working with partner and stakeholder organisations. Through this engagement and by advocating for the principles of Climate Justice the Foundation is pursuing the recommendations it made in its Position Paper on Protecting the Rights of Climate Displaced People.